I didn’t even realize what day it was until the evening news today: November 22nd. A news report on a local news station reminded me of what happened here 43 years ago today. We are here in Dallas to spend Thanksgiving with our children and grandchildren. When my father-in-law wanted to watch the evening news today, a local TV station had a short report on the crowd that showed up in Dealey Plaza to mark the 43rd anniversary of John F. Kennedy’s assassination here. I guess everyone remembers what he was doing when the news came across. I was in the 7th grade, and we were in the school gymnasium playing basketball during the end of the lunch break. Suddenly several teachers came into the gym and told us all to go to our classrooms. When we got to our room, our teacher had a radio on and was listening to the first news reports of what had happened in Dallas. When the confirmation came through about 30 minutes later that President Kennedy had been killed, school was dismissed and we all went home. That was on a Friday. We spent the next 3 days watching TV until the funeral had taken place. I remember my mom telling me she would always remember what she was doing when she heard the news via a radio broadcast that Pearl Harbor had been attacked on December 7, 1941 (she was cleaning the steps in our house in St. Louis). 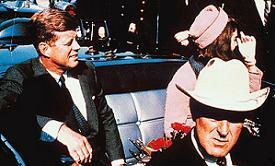 President Kennedy’s assassination on November 22, 1963 was the first day like that in my life. The 2nd was September 11, 2001.